Inky the Octopus thinks he should be thankful for his life in his tank, especially since he eats like a king, but his heart wants something more. He's curious about life outside the tank. So what is an octopus to do? Break out to find the open ocean of course. And when his tank lid is left ajar one night, Inky finds his opportunity. 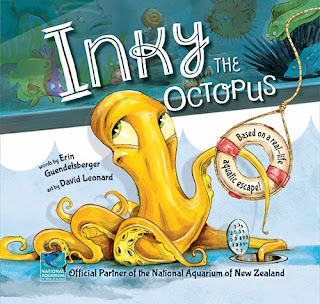 Inky the Octopus is a fun story based on true events. The true story is detailed in the back of the book along with a few other true octopus tales and some fun facts about octopuses. If you’re interested in reading Inky the Octopus: Bound for Glory, you can purchase a copy here on Amazon.